I love soup. I can eat it every meal. 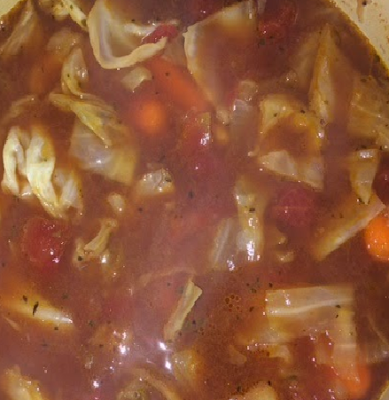 One of my favorite soups to make is Cabbage soup. Since we are in the midst of a cold spell, I figured this would be a great day to repost this recipe. It is very simple, filling and delicious. Add diced or stewed tomatoes, broth and tomato sauce. Feel free to add water if you think it needs it. If you want a little bite to the soup you can add a little red pepper flakes. I have not ate Cabbage Soup in years. My mother made it and it was delicious. I have the recipe. I should make some. Yes and you can change it up as you like by adding ground beef or different beans or veggies to it. I have never tried cabbage soup but it sounds delicious and would be so comforting to have during this cold winter.I must give it a try. I know what you mean. I love so many things now that I didnt touch as a child. Cabbage soup is a great comfort food. I haven't had it in a long time, but this has got me wanting to make some. Sounds good. I just need a few adjustments to make it vegetarian. How many cups is one carton? I am guessing 4, but am not sure. Hi Hallie, That sounds about right. I usually get the broths that come in the carton already. I love soup too. Looks healthy! This sounds so yummy. I love cabbage and hadn't thought to make a more hearty soup w/ it using beans. I've made a vegetable soup w/ it for a diet before and it was actually delicious. This really sounds good and I plan on making it this week. I love soup, too, and cabbage is a family favorite!! I am saving this. I love cabbage and always looking for recipes I can make with it. Yum!